Some weeks the weather here can be very mild and pleasant and it can be a total joy to be outside working on projects around the farm. Some weeks though the weather can be absolutely feral. This week, I totally cleared my diary of work and social obligations and focused entirely on fast tracking (i.e. completing quickly) the brand new chicken house and all weather chicken run (code named: Chooktopia). Not even the heavy snowfall on Sunday and near freezing temperatures could derail this juggernaut of a project! On reflection, it was actually a bit cold that day and just to keep warm, I was wearing two t-shirts, two wind cheaters, in addition to track suit pants under the overalls. By the end of the day all of my extremities were feeling a little bit chilly and slightly numb! As mentioned earlier the diary was totally cleared and a deadline was set for the transfer of the chickens into their new housing. Sometimes, you have to bite the bullet (as they say) and finish a project and that does require some sacrifices. I haven’t really mentioned it before, but the boss chicken is named “Rumpole” after the BBC television series “Rumpole of the Bailey” due to a weird and uncanny likeness with the lead actor’s face. Anyway, Rumpole the boss chicken is ailing and at the venerable age of five years, she may not survive the next few months. I have been keen to get her into the new housing which may be better for her health in the final few weeks. Last week’s blog entry discussed exactly what was not working with the current chicken house and run. 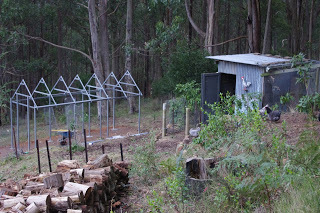 I have now taken all of those lessons learnt and incorporated them all into the new Chooktopia structure. August is normally a very wet and cold month at the farm, so I also became determined to get the chickens into their new housing before construction became too difficult because of the winter conditions. On a farm, the weather cannot be ignored! 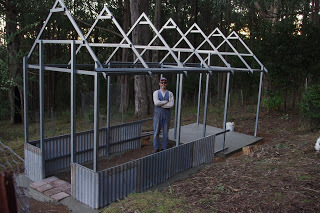 With the exception of a few hundred metal screws plus the cement products, all of the structure in this Chooktopia project are either: recycled; seconds; or downgraded materials. Scavenging for the various materials in a project like this, and then envisioning how they can be used, is a real skill. Scavengers also have to be willing to collect those materials from all manner of strange and unusual places. And each collection place for those types of materials has a unique and often very quirky vibe to it. Sometimes, the people in those places can be exceptionally helpful, sometimes they can brusque, and at other times they can be aloof and almost embarrassed that they have to sell whatever it is that you happen to be purchasing. Many years ago I purchased an absolute bargain of an unwanted water tank from an outer suburb of Melbourne. The houses in that particular area were very aspirational and to my eye seemed far too large for their land size. The guy that was selling this perfectly good water tank was almost embarrassed to have to sell it as if that activity was somehow beneath his social status. It wasn’t beneath his social status as he actually was selling the water tank and happily took the cash. I merely acted cool and chucked the water tank onto the (not quite bright yellow at that time) trailer and drove it back here where it has performed well. 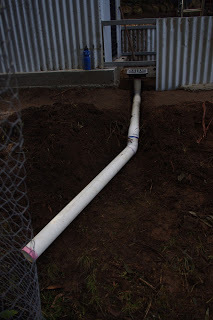 This week that water tank was removed from its previous location on the farm – which left a bit of plumbing mess for me to sort out (next week) – and was repurposed as a water collection tank for the new Chooktopia project. That sentence was easily written, but the water tank itself is about 100kg (220 pounds) of food grade plastic (polyethylene) which is a very slippery material that just happens to be moulded into a rounded shape, all of which make it one very difficult item to relocate. Needless to say the water tank was finally pushed, shoved and trolleyed into position to catch some of the rainfall from the roof of the chicken run and house. 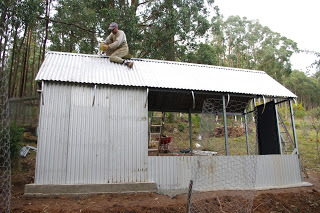 Before the water tank could collect rainfall from the roof of that structure, the chicken house had to be completely clad in the recycled steel sheeting. The roof sheeting also had to be installed and secured and then finally the ridge capping (which is the fancy name for the bit of steel sheet at the highest point of the roof) was also screwed into place. That ridge capping was made from two scraps of steel sheet, one of which I picked up at the local tip shop and the other I cut from scraps of galvanised sheet from previous projects. The roof and walls were completed just prior to a heavy downpour of rain later that evening. 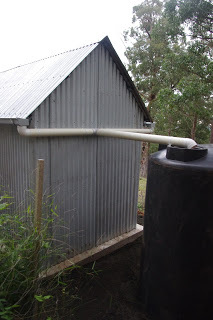 The rainwater collection system is very simple as any rain which falls onto the roof is collected in steel gutters. From those steel gutters the water flows into the plastic pipes which drain into the top of the water tank. The water which is stored in the tank is then piped into the chicken enclosure and can be accessed by a normal garden tap. The whole system is powered by gravity! On the morning of the day that it snowed here, I had decided that enough was enough and the chickens were moving into their new house regardless that afternoon. On reflection, it was perhaps an ambitious call, but sometimes deadlines are just the thing to speed a project along. Before the chickens could be moved into their new home, a quick fit-out of the interior of the chicken house had to take place. Fortunately, all that was required was to install the steel angle supports for the four plywood chicken laying boxes which were transferred over from the old chicken house. The feeder and water trough were also hung from the ceiling structure by chains. All of those were very easy tasks. The chicken run was also filled with 1 cubic metre (1.3 cubic yards) of composted woody mulch. The chickens can happily spend all day out of the weather digging, scratching and manuring into that woody mulch which will eventually produce an outstanding soil for use elsewhere on the farm. The hard job that day was installing the strong welded mesh which can withstand all of the birds-of-prey, foxes, cats and dogs that want to eat the chickens whilst they are innocently going about their chicken like business. The mesh for the new enclosure was removed from the existing chicken enclosure (leaving it completely exposed). Whilst this is excellent recycling, had I not completed the installation of that mesh onto the new enclosure, something/somebody certainly would have eaten the chickens that night. And that was why I was outside in the snowfall, cutting and installing the final pieces of welded mesh, whilst perhaps other people were sensibly keeping themselves warm in front of their heaters! Eventually the chickens were placed into their new home and all was good! 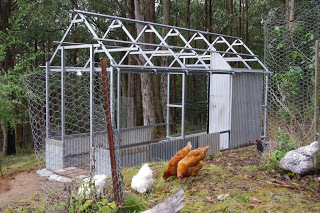 Both the editor and I are very happy with the new structure, whilst the chickens are mildly confused. The week’s weather has seen that the each day the sun is slightly higher in the sky which has resulted in an improvement in the house batteries charge. I promise to continue with the thread relating to the house construction on next weeks blog. The Chooktopia project this week has been bigger than Ben Hur! 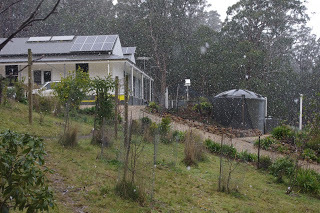 However, I will leave you with this photo of snow falling over the house and part of the orchard, which was taken during a brief break during construciton of Chooktopia. The temperature outside here at about 9.00pm is 3.8’C degrees Celsius (38.9’F). So far this year there has been 479.6mm (18.9 inches) of rainfall which is up from last week’s total of 452.6mm (17.8 inches). The farm has been in the grip of the Antarctic vortex for most of the week. The cold spell across the continent has been so strong that there have even been reports of snow settling on the ground in the mountain ranges of southern Queensland. Sunday morning dawned cold and clear. In fact Sunday was apparently the coldest morning in 18 years. As I awoke to see what the new day would bring, the outside thermometer was registering -0.6’C (30.9’F) which was as cold as I can remember here. 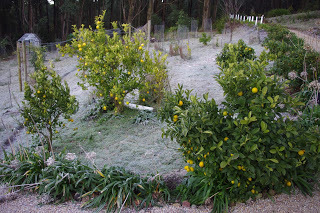 And a heavy frost had descended on the farm too. Occasionally I display a softer side to my personality and I’d allowed the dogs to sleep inside the house in front of the wood fire earlier that night. 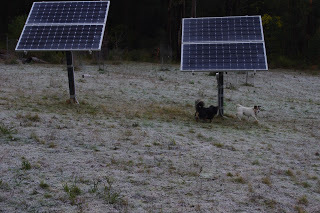 By the time that the sun had begun to peek over the horizon the dogs were becoming restless and a bit fidgety. There is no better way to reward such early morning canine exuberance than to kick the little rotters outside into the very cold and frosty world of “outside land” – an unpleasant place at that time. Scritchy the boss dog normally sleeps inside the house as she is of an age where such comforts are a perquisite of her position in the pack. It is worthwhile noting that the photo clearly shows every single muscle in Scritchy’s body was taught with the stress of encountering the full fury of the Antarctic vortex in all its frosty glory. Observant readers will note the small log in the frozen herbage and may wonder about why that log is in that particular position. 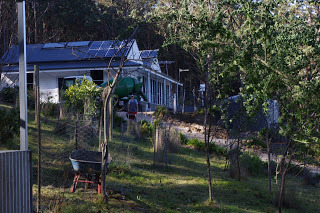 The reason for that log is that I’ve been watching the movement of the sun and over the next six months or so I’ll install another four solar photovoltaic panels in that general location. Frosts are very rare at the farm, so I also braved the frozen conditions – purely for research purposes mind you – and took the camera out into the frosty conditions so as to take some interesting photos for this blog. 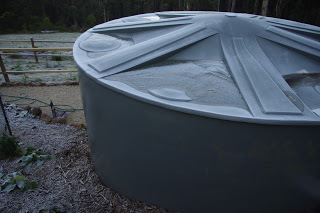 One such photo was the native birds watering well on top of one of the water tanks which had frozen solid overnight! The weird thing about frosts is that they wash out the normal colours in an environment and leave a sort of sepia toned perspective. However, some of the citrus fruit trees (limes, lemons and grapefruit) were having none of that and they delivered their usual consistent winter cheer with lots of fruit. The frost eventually thawed out, but in the meantime I enjoyed the occasional latte or two and kicked back and relaxed. It occurred to me this week that it is actually possible to achieve far more work during summer (despite the excessive afternoon heat) than during the depths of winter, when I have serious reservations about working outside during the frozen conditions. Nonetheless, work on the new chicken enclosure and chicken run (the chooktopia project) continued apace and a proper drain was glued and cemented in. 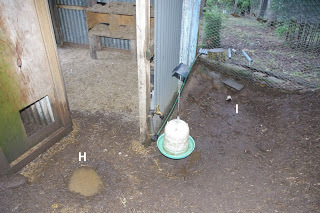 With the drain, any water that spills from the chicken’s water bucket (which will hang above it) can exit the enclosure without emptying into the chickens deep litter mulch. 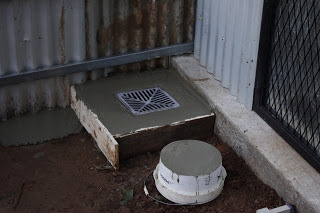 The new drain also has a wonderful steel grate which will stop rats from climbing up the drain pipe and entering the brand new chicken enclosure (take that you intelligent rodents!). The pipe also has the added advantage of draining onto a walnut tree which will be more than happy with the extra watering come the hot and dry summer conditions. The upside down bucket with the handle in the photo above is not actually a strange form of very unappealing (and possibly spoiled) grey ice cream. That bucket is actually the formwork for a circular cement stepping stone. The concrete stepping stones are intended to rise above the chickens deep litter mulch which will fill that enclosure later this week. 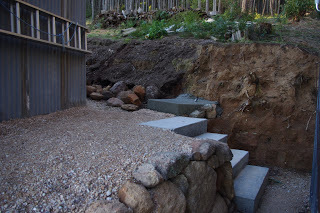 Before we continue with the story, it is worthwhile mentioning that it took about half an hour of discussions and practice walk throughs before the final location of each individual concrete step was agreed to. This is serious business as we have to live with this stuff every day! And as of today, I have constructed four of the eventual six stepping stones. As a bit of a confession, the chooktopia project is without doubt amongst one of the most complex sheds that I have ever built. The complexities have arisen because I am absolutely determined to foil those cheeky rats, who twitch their noses at me in contempt every single day of the week. Enough is enough, I say! 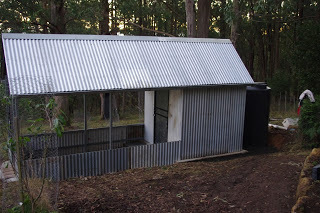 The front door was hung on the enclosure and the internal chicken shed door also received a solid backing of sheet steel. The black front door to the enclosure was quite the find at the local tip shop for only $25. The reason that the door was such a find was because the original purchasers would have paid many, many hundreds of dollars for it only to throw it out because perhaps it was the wrong colour. 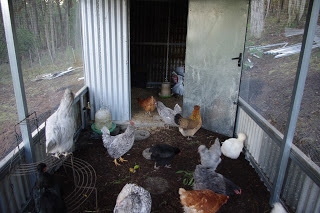 It is also worthwhile pointing out that with the exception of the screws and cement products – every single item on this chicken shed and enclosure is either recycled, scrap, seconds or down-graded materials. Architecture that is both beautiful and functional need not cost a life savings. Today, I commenced installing the roof sheeting. Apparently the weather tomorrow will bring strong winds so it was prudent to install the roof sheeting today when there is less chance of it blowing away and onto the neighbouring properties! Hopefully by the next blog entry the chickens will be enjoying their new house, enclosure and toys (yes, you read that bit correctly) – although there is much work yet to do with the construction, and rain is forecast again for mid this week! In other farm news, I was searching through one of the cupboards and came across (ta da!) an empty demijohn. 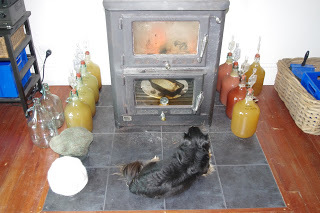 I couldn’t believe it, so that demijohn was quickly pressed into service. Readers with good memories will remember the excellent harvest of medlar fruit from earlier this year. Medlar’s are an interesting fruit because you have to allow them to ripen to an almost unsociable condition before consuming them. For those that are interested, medlar fruit tastes to me like a date. Anyway, I had a whole box of these things and I was wondering what to do with them. Wonder no longer readers, because they have now been converted into a medlar country wine which promises to taste quite interesting! Last week, peak wine bottles was a bit of a problem. Fortunately, and by a strange coincidence earlier in the week I was miles away from the farm in the big smoke but also just around the corner from a packaging wholesaler which happens to do cash sales (for people like me). 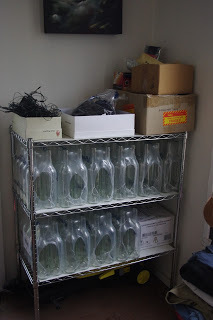 So I decided to purchase 100 additional wine bottles (with screw tops) for use at the farm, and wouldn’t you know it? I bump into a local there in the showroom. Like, what is the chance of that happening in a big smoke of 5 million people? It was an extraordinary coincidence, and of course they wanted to know my business too! The dreaded peak wine bottles has been averted for now, but who knows the future? 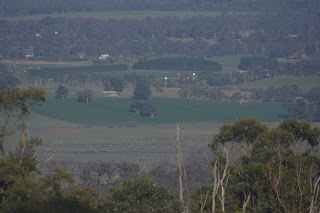 Observant readers will notice that the trees in the paddock are completely unharmed and that the surrounding paddocks are dotted with many sheep and other cattle. How did the house get here? 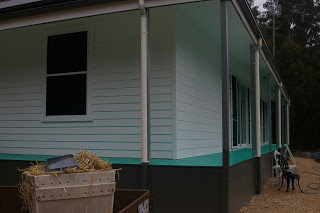 In May 2011, the strange blue / green waterproofing agent was applied to the very thick fibre-cement veranda decks, whilst the outside of the house was mostly painted before winter set in. Strange blue / green veranda decks are just that – strange! No one wants that (including the editor) on a house, so I commenced covering that strangeness with ceramic outdoor (i.e. non slip and non-flammable – unless you happen to be confronted by the same conditions as a Space Shuttle upon re-entry) tiles. 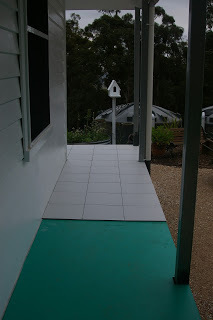 There is even a small strip of metal between the bottom of the fibre-cement weatherboards and the fibre cement veranda deck which stops rain water from seeping back under the deck and into the wall. Not all of the house is purely pragmatic, sometimes a hint of whimsy is also to be found. One such example of that is the steel (i.e. non-flammable) staircase which was commissioned from a local artisan blacksmith. Mind you, in days of yore a computer driven plasma cutter would have been not only hard to find and power, but the various moons and leaves the blacksmith cut into the stair stringers (the fancy name for the side bits that hold the staircase together) would have been a very tall order. The steel flowers and leaves that wind through the stairs on a steel vine would have probably been a non-starter too! I even somehow managed to annoy the blacksmith by painting the entire staircase with serviceable metal primer and black gloss metal paint. He may have even used the word “abomination” to describe my metal preservation techniques, but I sort of glossed over (pun intended) that memory. 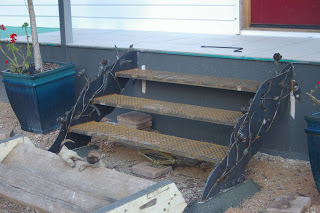 Why anyone would want good steel work to rust into oblivion, by choice, is well beyond me and it was at that point in time that our company parted – despite having need for further sets of steel stairs. 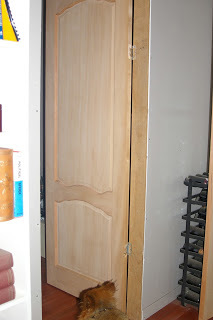 Visitors were well pleased that month too, because I installed internal doors. The photo below shows Poopy the Pomeranian looking into the bathroom and wondering why there is suddenly a need for all of these doors on the bathroom. 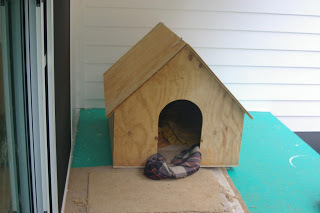 There were scraps of the very thick roofing plywood leftover, so that month all of those scraps were absorbed into a brand new dog house. One side of the roof of that dog house is hinged so that I can either chastise the dogs for making a racket (and attempting to hide in the kennel) or clean out their kennel – either way is fine by me. The kennel is lined with scraps of wool carpet (expensive stuff) and also woollen blankets which the dogs distribute around with the weather conditions as they see fit. The temperature outside here at about 10.00pm (working late today!) is 5.9’C degrees Celsius (42.6’F). So far this year there has been 452.6mm (17.8 inches) of rainfall which is up from last week’s total of 422.2mm (16.6 inches). In keeping with the recent Star Trek references on the blog I thought that I’d introduce readers to the Antarctic Anomaly which is hovering over the South Eastern corner of this continent! In Star Trek speak, an anomaly is anything that is unusual or can’t be explained and that story trick is quite often rolled out to wind up an otherwise complex storyline that would be too difficult to finish in under an hour. Everyone has heard of the story finishing with the ending: “And then I woke up”. It’s a bit of a lame ending and everyone knows it. Anyway, an Antarctic anomaly is sort of like that because the Bureau of Meteorology promised an “Antarctic Vortex” with snowfall down to elevations of 600m (1,968 feet). Storms damage homes in NSW as heaters cause fires in Melbourne . The weather here has certainly been windy, cold and damp. However, to me the conditions haven’t felt extreme and it was much colder a few weeks ago, though perhaps not as wet. 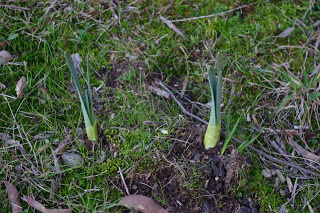 Other parts of the continent have felt the winter bite much harder than here though and there have been reports of snowfall up in the mountains of southern Queensland and northern New South Wales which are normally very sub-tropical environments. Here, the vortex has simply has driven me indoors. One of the interesting things about living on a farm is that there are a lot of outside activities to do. The weather therefore dictates through every season just how much outside activities can be performed. By necessity I keep a very close eye on the weather. 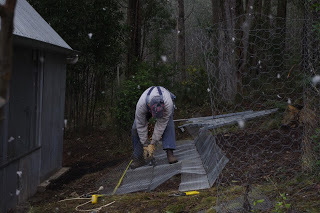 This week I managed to put in one single full work day on the new chicken enclosure before the Antarctic Vortex hit the farm. The rain began on that evening too just as the sun dropped behind the horizon and I hadn’t yet put either the chickens or the tools away. Needless to say both: the tools; the chickens; and I all ended up a little bit wet. A few days earlier during this week, I’d spent a day at a business where everyone was sniffling and sneezing. That sort of thing doesn’t bother me, but then the next day I started sniffling and not feeling very well either. I could not deny that the future weather was going to dump some serious rain with that Antarctic Vortex, so I just “manned up” and despite my sniffles, I got to work with the construction before the wild weather hit. 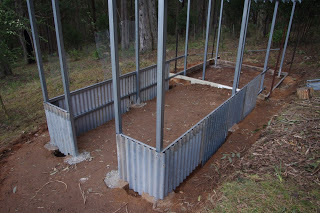 The new chicken enclosure has now had the steel roof battens installed. A roof batten is a fancy name for the horizontal bit of steel which the roof sheets are anchored too and there are three of them on each side of the roof. Roof battens in this instance also perform the useful function of keeping the roof trusses (the A frame bits of steel roof) upright and braced. The black internal door to the chicken shed was hung that day too. 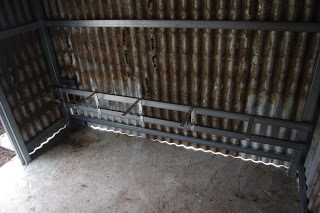 And I even had time – between all of the whining about being sick (spare a thought for the long suffering editor) – to install some of the chicken shed steel sheeting. I felt pretty good about the work done and day’s hard work did much to relieve the suffering from my sniffles. No further outside work was possible after the rain hit. However, given that there is already an existing chicken run and enclosure I thought that it might be useful to share some of the things that aren’t working with the current structure and what I’m doing about it with the new chicken project. It highlights many of the things that I have learned over the past four years about chickens, their sheds and their enclosures. 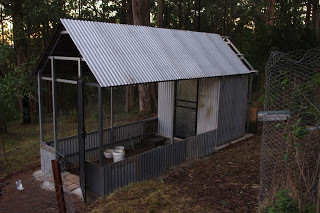 A – The roof of the chicken enclosure / run is uphill of the chicken shed. Because of the angle required for the roof, it collects every single stick or leaf that has ever fallen onto it. Roofs should generally be designed to shed those materials onto the ground. The welded steel mesh that forms the roof also traps leaves and sticks in the mesh (and plenty of them can be seen in the photo). A solid steel sheet roof that is angled downhill will assist with shedding that organic material off the new chicken enclosure roof. It will also help to keep the new enclosure dry during winter and shaded during summer. B – Observant readers will have already noticed the logs around the chicken enclosure. Those logs were put in place to stop the incessant digging by predatory animals to get into the chicken enclosure for an easy feed. On the internal side of the chicken enclosure the chickens were also thoughtlessly scratching away at the buried steel wire which was protecting them from foxes, dogs and cats. 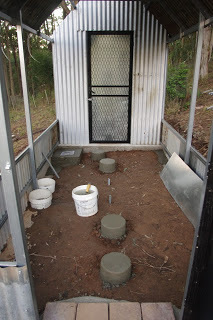 The new enclosure includes buried sheet metal encased in concrete which should eliminate that problem. C – Poopy the Pomeranian showed me very early on that he could easily chew through heavy duty chicken wire – given enough time – so the current chicken enclosure has a double layer of that heavy duty wire and this seems to have resolved that issue. However often the dogs and the chickens give each other stink eye through the heavy duty chicken wire. Each of the different species wants to eat the other (seriously!). To add a further complexity, the rats can use the chicken wire as a ladder into the chicken shed and enclosure. The simplest way to resolve those problems is to have a skirt of solid steel sheet buried into the concrete surrounding the new enclosure. D – A few years back I had to modify the roof of the chicken enclosure because the local parrots discovered that with a bit of effort they could get into the chicken run through a small opening underneath the roof drain. Once the parrots were in the chicken enclosure they gorged themselves silly on top notch free range chicken feed. The unfortunate thing about that situation was that the local parrots were just not quite smart enough to get back out of the enclosure again! I added another layer of chicken wire over the roof drain to keep the parrots out. However, the rats now use that roof drain as a super highway in their travels and I can no longer clean the drain of their manure. You’ll also notice that the roof drain is on an angle of about 20′ from vertical which means that it overflows during very heavy rain – as it did this week. On the new enclosure the drains are on the outside of the construction. E – The steel wall sheets do not cover the gap between the top of those wall sheets and the steel roof sheets. The gap is not big enough for the local birds to get into or out of the chicken shed, but it is big enough for the rats to happily frolic about at night twitching their noses at me in sheer pleasure for the tower that I inadvertently built for them. F – I used steel reinforcing bars for the high up perches for the “cool kids” of the chicken collective (The Borg anyone?). Chickens that are in the higher echelons of the pecking order like to sleep higher up at night than the lower order chickens. Steel makes a better perch for such chickens because leg mites live in timber perches and those can become a nuisance for birds and can eventually even make chickens lame if they are left untreated for too long. Treatment usually involves smearing the chickens legs with a petroleum jelly which is not a fun process for either me or the chicken! Getting back to the perches, the problem with the current setup is that the jump between the top of the laying boxes and the highest perch is just a little bit too high for the cool kids and sometimes – well quite often, really – they miss the perch and fly back to the ground. It is hard to look cool for a top order, head honcho chicken when that sort of thing is going on and the under chickens snigger as they see it happening! An intermediate perch will be installed (at a location where I am also not likely to accidentally walk into it which would also be very uncool) where the cool kids can jump their way to the giddy heights of chicken coolness! G – The very uncool kids of the chicken collective sometimes end up perched at night on top of the lowly plastic feed bin. Ordinarily, this wouldn’t be a problem except that most days I have to open the feed bin and it is usually covered in chicken manure. 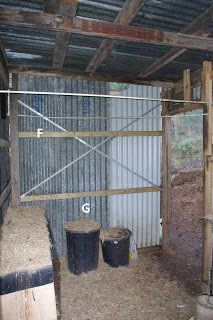 The feed bin has to be stored under a hinged cover that the chickens can’t get onto and do their night-time business on. H – In point D above, I mentioned that the roof drain overflows. 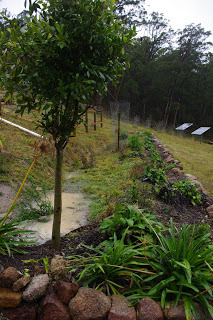 Well, the excess water collects at this low point in the chicken enclosure / run. The best way to avoid that problem is to not have it in the first place and the new chicken project aims to achieve that. 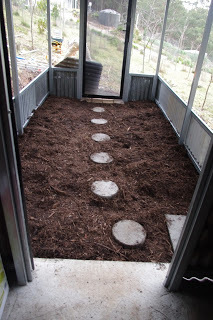 I – The current chicken run has a very deep mulch which helps turn the chicken manure into soil. However after well over an inch of rain, the entire deep litter gets very soggy and can potentially turn anaerobic (which is a fancy name for an environment where the harmful bacteria that are happy to live in an oxygen-free environment thrive). Many years ago I installed a drain pipe to take away any excess water in the run at the lowest point. As you can see the white pipe has broken because the chickens scratch and dig around the pipe. Also the deep litter mulch tends to block up the pipe during a very heavy rainfall and sometimes the pipe can disappear entirely underneath a small mountain of soggy mulch. A solid roof keeping the worst of the rain off the deep litter as well as a concrete pit for the drain should rectify those issues. There is plenty that does work well with the current chicken shed and enclosure and the ladies are far better off in there than in an industrial chicken farm. However, the new chicken shed project aims to resolve a lot of the current problems and make life just that much better for the ladies. Back to the Antarctic Vortex though and the weather this week certainly dumped a whole lot of rain on the farm. A good storm tests all of the water systems and I noted that by the afternoon of Sunday, despite the lack of snow, the swales had started to fill up. A well-established Ficus tree and a much newer golden willow behind it were enjoying the wet conditions of the swale. The rain provides an excellent opportunity for inside activities and one my favourites is home brew. I’ve been working towards being able to age my country wines for at least a year before consumption and have run into a bit of a problem. Already the farm has been hit with the awful problem of Peak Rocks and also Peak Jam Jars (bottles). But now, brace yourselves for the worst situation of all – Peak Wine Bottles. Seriously this is true, as the local waste transfer station has stopped anyone from recovering any materials at all – and they have thousands of the things. The much further away tip disposes of glass bottles into a huge dumpster where the bottles mostly smash anyway and I assume that the glass is shipped to China for reprocessing. So now, I’m having to go and purchase a product that people otherwise throw out every week (crazy days indeed!). Go figure! 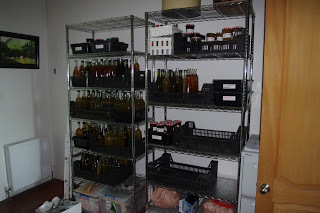 In order to achieve that goal of ageing all of the home brew wines for at least a year, I’ve had to double the amount of steel racking which I use to store all of the wines, chutneys and jams. This is serious business! The very heavy duty black plastic storage bins were a freebie gift from the local daffodil farm and they are almost indestructible and help spread the weight load across the shelf. In breaking dog food news, I’m still in the early experimental days of dog food production. It now takes about two hours of work per week to produce a week’s supply of 100 x dog biscuits and all of their breakfast mix. Every time the biscuits are in the oven I keep thinking that because they smell so good, they’d be better served as a savoury side order to a seafood chowder than to give to the dogs. The temperature outside here at about 8.30pm is 4.1’C degrees Celsius (39.4’F). So far this year there has been 422.2mm (16.6 inches) of rainfall which is up from last week’s total of 382.4mm (15.0 inches). 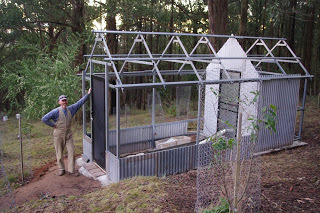 Chook-trek: The next generation of chicken housing and enclosure on the farm. These are the voyages of the chicken house and enclosure. Its five week construction and mission: to permanently exclude rodents, to provide all weather shelter; to make it quicker and easier to maintain the chickens; and to boldly go where no chicken has gone before! Seriously, the chickens have been curious about all of the fuss and activity just downhill of their current enclosure, but they haven’t yet steeled (pun intended) themselves to explore their new home which is currently under construction. Earlier in the week I constructed seven of the A framed steel roof trusses (that is a fancy name for the pointy bits that give structure to a roof). Later that afternoon the roof trusses were installed onto the steel frame and the proportions of the new chicken enclosure and shed started taking shape. Looking at a half constructed building for me is like tasting cake batter before the cake has been cooked. Cake batter always tastes nice to me. It is exciting for me too because the steel frame is now showing a beautiful symmetry which is very pleasing to the eye. 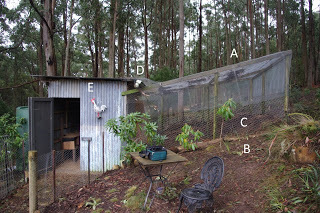 In the above photo, you are able to see the existing chicken shed and wire enclosure and a couple of chickens loitering about enjoying themselves. That original shed won’t be wasted and will eventually be converted into a firewood storage shed. Observant readers will note that there is a very handy pile of firewood just waiting to be stored in that future shed so that it is kept out of the wintery wet weather. The rats and field mice have always been a problem with the existing chicken shed and enclosure. Honestly, the little rodents currently twitch their noses at me in utter contempt every single day whilst enjoying a healthy diet of whatever the chickens chose not to eat as well as some very yummy grains which I’m paying for. The rodents also currently have access to fresh water which they’re happy to leave their manure in and they’ve also been known to climb the fruit trees on warm summer evenings enjoying the ripening fruit which I would have otherwise enjoyed. Over the past four years it has been a battle of wills between myself and the rodents – and they’re winning. However, observation is a useful tool, and I have been watching the rodents and learning their patterns and habits. The new enclosure and chicken run incorporates everything I’ve learned by observing the rodents behaviour. Rodents can dig, so in the photo above, the steel corrugated skirts are buried into the trenches. Those trenches are then going to be filled with structural grade cement. Take that you rats! The chicken house, which is at the far end of the structure in that photo, will sit on a proper concrete slab. That is the sort of slab that can hold up a house and which the rodents will be unable to dig into. Take that you rats! It is also worth remembering that it is extraordinarily difficult for a rat to climb up a vertical smooth steel surface. And take that one too, you rats! On early Sunday morning, the sun shone and although it was also very cold, being the middle of winter, the local sand and soil guy brought his small mini mix truck up the mountain to the house with a load of 1.2 m3 (1.56 m3 yards) of cement. Mixing that much cement by hand is possible, but it is a job that is beyond me in such a short time frame, so I called in for help. The truck delivers the cement directly into a wheelbarrow and then I wheeled that over to the construction site. It took 38 minutes to unload that much cement by wheelbarrow and I was feeling quite hot and bothered by the end of that job. I accidentally dropped one load of cement into the orchard too and said many words like: Fudge! 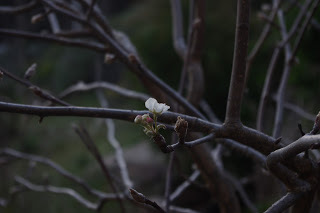 (actually, I said something else altogether – and many times over too according to the editor who was on hand) – but I am trying to keep the blog family friendly, so will remove the specifics. Kudos to the editor too who set out the timber formwork so that it was not only both level and square, but also importantly that it was able to withstand the pressures placed on it by the huge load of cement. The timber formwork has to be quite tough as it takes a lot of effort to work the face of the cement so that you achieve a very smooth finish. The editor has since declined my suggestion of moving to the career path of concreter and said something about there being not enough Sorbolene in the world to apply to her hands for her to consider pursuing that particular career option. Later that day, despite the cold conditions, the cement had started to cure and the timber formwork could be removed. Despite the best efforts of a magpie bird leaving its footprints in the new concrete slab (which we had to repair in a hurry), the whole thing looked awesome. Honestly, it is no exaggeration to say that I’ve seen house slabs that didn’t look as good as the new concrete slab for the chicken house here. The curious magpie taught us a valuable lesson and it was now considered to be very likely that overnight the local wildlife would happily check out the slowly curing cement. To prevent this disaster we set up steel barriers as dusk set in so that the wombats and wallabies couldn’t engrave their initials into the concrete slab during the night. Imagine the total outrage of finding the next morning a scrawl in the brand new concrete slab: “Fatso the wombat was ‘ere, 2015”. Of course correct punctuation may not be Fatso’s strong suit! 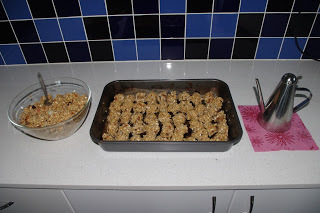 Anyway, after all the concrete work, we enjoyed a coffee and a fresh Anzac biscuit and we were both knocked out that night. 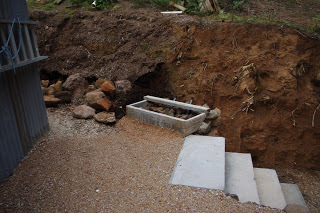 It wasn’t all about the chooktopia structure though, because with the delivery of cement, I took the opportunity to commence building the new staircase behind the new firewood shed. The day before the cement delivery the timber formwork for that stair step was set up. The stairs will eventually lead up to future tomato, potato and strawberry beds so they will become quite important. On the Sunday morning of the cement delivery, any and all excess cement was used to build the beginnings of that new staircase. The trees here are of the species Eucalyptus Obliqua (Messmate) and they are the second tallest flowering trees in the world after Eucalyptus Regnans (Mountain Ash) which are to be found a bit higher up in the mountain range. 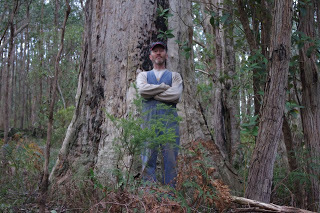 The trees here can potentially grow to a height of 90m (295ft)! A few weeks back I mentioned that just to the side of the orchard there was a very large tree stump. It is a fire damaged tree, which on closer inspection is still alive, and I’d been walking past it for years without ever noticing it. Then one day a few weeks back, when I was on the hunt for rocks, I happened to spot this tree from a completely different angle and went to myself: “Whoa, that tree is massive!” The reason, I’d never noticed the massive tree before was because the damage was such that the top of the tree has literally fallen off due to wind, termite, disease or fire damage and has either been completely burnt or decomposed. Certainly the tree would pre-date European settlement and it is great to see that despite all of the challenges thrown at it, the tree still lives. You go tree! The combination of damp soil and changeable weather is promoting the growth of a lot of interesting and unusual varieties of fungi and I spotted this interesting specimen yesterday. 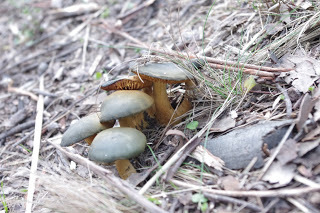 Nothing quite yells: “I’m toxic – don’t eat me”, like a mushroom with a dark green black top and a yellow / orange underbelly. The temperature outside here at about 8.30pm is 4.6’C degrees Celsius (40.3’F). So far this year there has been 382.4mm (15.0 inches) of rainfall which is up from last week’s total of 376.6mm (14.8 inches).